September 30 Update - New Zealand! Semi-interesting conditions towards North America. The afternoon was very interesting though, as OJ spotted a DU dialect on 1233 and then on 1224. First thought to be the Australian. Absolutely not. A "B-Sport, Sports news update" revealed that this was Invercargill, New Zealand! Several other NZ stations found on the full hour at 1600Z including 927, 1080, 1107, 1116, 1152 and 1233, 1287 and 1458. The familiar Newstalk ZB Wellington 1035 had a very potent signal. Antenna in use: QDFA. We should have compared it with the original NZ antenna, the 58 beverage but we didn't pay attention to the stations until after we had recorded the full hour on the Perseus'. One verie last night, 1370 WFEA Manchester NH. In any case, the 350 degree bearing of the QDFA makes it a much more westerly oriented antenna than I had expected, given its broad front lobe. The 310 hears eastern North America better, but the QDFA sort of takes the rest, including Hawaii and Japan. The big question is: Is it too broad? Will the more directive beverages prove better in the long run? Time will tell. Recent veries: 1330 WRCA Waltham MA, 1230 KSYM Mankato MN, 1410 KOOQ North Platte NE and 1490 KCFC Boulder CO.
has finally been written. You should find a 1.2 MB pdf here. Conditions: Nothing exciting this night and morning. Except that the grim weather report never materialized. Checked a few of the Sept 24/25 recordings and all the Sept 26 recordings. Conditions not too bad. Stations worth mentioning are 710 KCMO Kansas City MO, 790 WAYY Eau Claire WI, 1370 WFEA Manchester NH (basically a new log), 1410 KIIX Ft Collins CO under KOOQ, 1430 KCLK Asotin WA, 1470 WNYY Ithaca NY and a very potent 1490 KQDS Duluth MN with its new moniker "The Fan 1490". The QDFA still proves to be superior at night, while the 310, connected to my other Perseus, dominate mornings. Actually, comparing the QDFA and the 310 is a bit unfair to the QDFA since the 310 has many of the European stations in its side null. It is somewhat more sensitive towards eastern North America and South America while the QDFA with its 350 degrees bearing goes further west. To illustrate my point: At one instance on 1430, the 310 beverage had KLO on top and CKHT audible underneath, while the QDFA had KLO on top but KCLK Asotin WA close behind. The minor disturbance seen on the 21 apparently stirred up the ionosphere enough to allow good conditions the day after. Very good signals especially from Colorado and Nebraska on Sept 22. A brief check of two of the TOH recorded (0200 and 0300Z) revealed KKAR Omaha NE 1290, KFKA Greely CO 1310, KOOQ North Platte NE 1410 (new log), KGRE Greely CO 1450 (with a monstrous signal for a GY station!) and KCFC Boulder CO 1490 (new log). Most interesting stations were found above 1100 kHz. The QDFA is still performing well. With two Perseus' running, one with the QDFA and the other with the 310 beverage, I could compare the two antennas at 0300Z, 42 minutes before sunrise. Even at this transition period, the QDFA was noticeably quieter than the beverage. Not very exciting the last few days, especially tonight with higher K-indices and little to be heard. Friendly email from the PD on KYES Rockville MN though. KYES is serving the St. Cloud area and they also air Relevant Radio. I also received a Twitter message, making it my first Twitter QSL. Cool to see new AM voices. KYES is going to be quite dominant in the Arctic part of Europe. A few new ones for me logged the past weekend and Thu morning local: First KXYZ Houston TX 1320 on the QDFA, later on WCCN Neilsville WI 1370 on the 310 beverage. At 0200 Thu KYES Rockville MN 1180 surfaced over 1179 on the QDFA with a nice full-hour ID. KYES is new, 5 kW nights most of it going NE so is bound to be a dominant in these parts. Veries from KXYZ and WCCN. Receiver: Perseus. Yes, it does. At nighttime, when strong signals from Europe dominate the band, the QDFA has proven to be totally superior. 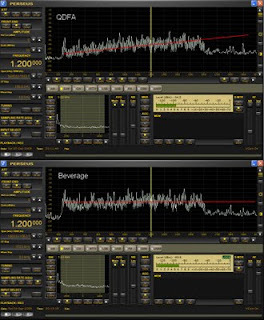 In a large number of instances where EU QRM totally obliterated the NA frequency when using the beverage, the QDFA either brought audible levels, or even readable levels. If I had audible levels with the beverage, the QDFA produced readable levels. And in every instance where the beverage had readable levels from North America, the QDFA produced better readability. There is no going away from this. Check it out yourself. These 10-second recordings from 1510, 1520, 1540, 1550, 1560, 1570 and 1600 should provide enough evidence. The first 5 seconds are recorded off the beverage, the last 5 off the QDFA. So what brought these dramatic changes from last weekend? I don't know for sure. Maybe the radials I put out worked. Maybe propagation didn't favour the properties of the QDFA. Maybe there is some other obscure reason. My unqualified guess is that the radials worked. Btw I added another set of radials just before it got dark; they run perpendicular to the loop. Of course this doesn't change the fact that the QDFA sensitivity rolls off from around 1000 kHz and downwards, and the fact that when the interference is reduced by approaching daylight the beverage is always more effective. But we knew that all along. The QDFA is set up for being able to DX the difficult midnight to dawn period. Thanks Dallas Lankford for this extraordinary experience! Update: It appears that the effect of the QDFA bleeds away when civil twilight approaches. 45 minutes before sunrise (twilight lasts much longer at northern latitudes) there is virtually no difference between the QDFA and the beverage, although EU interference is still quite heavy. I wasn't prepared to let tens of hours of work go down the drain. Several sources have indicated that antennas with vertical elements such as the EWE and K9AY depend on good ground to produce good nulls. And that radials is one way to improve their performance on poor ground. So I found some rather thick copper string, surplus from navaid upgrades at the airport, and laid the wire on the ground at 45 degrees intervals. I don't know if it's the radials or condtions in general or what, but it appears that the QDFA is indeed functioning better now. I was able to null the slop from St. Petersburg 1494 enough to get a readable signal from Longyearbyen-1485. Furthermore, I tested 1557, where the 58-degrees Asia beverage had Taiwan and France (backlobe) equal strength. The North America beverages had Lithuania very strong on their backlobes, while the QDFA (which points directly towards Lithuania on its back lobe) had Taiwan soundly on top with France underneath. So maybe, maybe, maybe. The coming night will tell. First Chinese NDB Heard In Europe (Edit: Norway)? Heard today with my Perseus connected to a 58-degree beverage at 1800 UTC. The distance should be roughly 6,500 km. Extremely weak, of course. Thanks for your info, Michael! First, let me point out that ground matters. Very poor ground favours the beverage (and other longwire type) antenna. Antenna designs like the EWE and K9AY want good ground. Both the EWE and the K9AY have been tested here, with mediocre results while a good ground K9AY made wonders for me home in Berlevåg. The beverage is literally on "home ground" here in Kongsfjord and would prove to be a worthy opponent to any other antenna design. A beverage in Grayland may not be allowed to reach its potential because the beverage thrives in the lossiest ground. Let me also point out that the two places where the QDFA has been tested before have much better ground than the rocky, stony morenes in Kongsfjord. Dallas Lankford mentioned that EZNEC simulation did not give any answer as to how the QDFA would perform over lossy ground. Maybe this real-world test does. Last night we compared the QDFA with two beverages (and even one pointing way off North America). The 310 is my favourite nighttime beverage because of less European QRM than the 340. The latter performs best during daylight hours. So basically, the competition was between the QDFA and the 310. Conditions favoured the eastern part of the USA and Canada. Signal levels were from threshold to "fair". In short, there was no significant difference. On upper MW, the signal-to-noise levels were roughly the same or a few dB in favour of the QDFA. Readability was mostly the same. What I heard on the QDFA I could also hear on the 310. The reduced sensitivity of the QDFA revealed itself on frequencies like 740 (Ontario) and 590 (Newfoundland) where the 310 had audible and even readable levels (590) and the QDFA couldn't hear any audio. On an undisturbed frequency like 1650 (Ontario) the QDFA and the 310 were identical. The QDFA was less sensitive to Loran C noise though, even if the Loran C station is in its front lobe. So, is the QDFA a failure? Definitely no. It is probably just placed on the wrong spot, and even then it matches the 310 in performance, at least on the upper half of the MW band. It has a wide front lobe, and it can null a very wide angle off the back. And it is extremely quiet. It performed somewhere along the lines Dallas Lankford had predicted (or feared), given the lossy ground. Since it was an astounding success at Grayland, it should be equally good on a European site with good ground conditions. The downside is of course that you have to make it yourself and it takes up quite a bit of space (120 meters from end to end). And you need to make sure that the deltas don't collapse if you're in a windy location. Tests performed Saturday night at around 2300 local suggested that NRK Longyearbyen 1485 (in the desired signal path and in fact an indicator station) was around 5 dB stronger on the QDFA than on the beverage. At the same time, European interference was down by a few dB up to 10 dB, giving a net signal to noise improvement of 6-7 up to 15 dB over the beverage. Listen to this audio clip to hear the difference (beverage first, after 5-6 seconds you hear the QDFA). However, at half an hour prior to sunset Sunday morning, we were unable to detect significant effects of the improved back-to-front ratio. It was also quite evident that the QDFA is less sensitive than the beverage up to around 1100 kHz. So in cases of low signal levels (say from the last hour before sunset and onwards) a beverage will outperform the QDFA with its gain alone, except perhaps in the highest part of the MW band (1400 kHz and up). This is part of the equation though. We did not expect the QDFA to outperform the beverage at any other instances than during periods of high signal levels. If it in fact does that, and to what extent, can not be determined by one morning's listening. The QDFA lobe is wide. Too wide to separate stations with close bearings, say 20-30 degrees, which a well designed and long beverage can do. We knew that. It was interesting to hear Northern Asian stations like Japan with similar signal strength as the North Asia beverage. 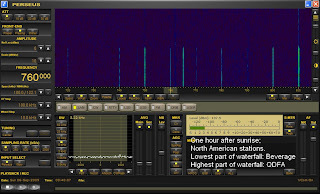 This is not necessarily an advantage if you are pursuing daytime North America DX as Asian stations will tend to interfere. But it means that DX-ing Japan in the evening may be possible with less interference from European and Middle East stations than is possible with a beverage. Further tests are needed to confirm this. We also don't know which effects different kinds of propagation has on the QDFA performance. It is plausible that in some instances, the attenuation of signals off the back may be significant, in other instances it will be undetectable. Again, one or two nights of listening is not enough to draw any conclusions. A quick visit to the 60 meter and 49 meter bands revealed that the QDFA has a significantly higher noise level than the beverage and is much less suited for DX-ing than the beverage. Up to and including the 90 meter band the QDFA may actually be better, while they are roughly equal on the 75 meter band. The noise level is still marginally higher. Don't waste your time on the higher Shortwave bands with the QDFA. The two illustrations shows the difference in gain in two ways; one over the MW spectrum where the QDFA gain "rolls off" towards 500 kHz, and one compares a small spectrum on low MW one hour after sunrise. The NA signals on the beverage weren't very strong either with VOWR-800 as the strongest one. We are beginning to become hysterically enthusiastic about the QDFA. We are underway. Yesterday and this morning we were quite frustrated. First, I managed to switch polarity from the battery and thought the phaser preamp was dead. So we replaced it with another preamp. Tests today revealed that it was by no means dead, so it was refitted. We were taken aback by the low signal level compared to the reference antenna, a beverage directed towards North America. Testing on groundwave signals yesterday afternoon was not promising at all. So we thought something was wrong, and tried every possible way to find out what it was. No luck. So this morning we made some more measurements and called the QDFA Helpdesk, aka Dallas Lankford. Following his advice we connected two preamps with a total of 24 dB to the antenna. The noise floor barely moved. Dallas also informed us that the QDFA doesn't work too well on groundwave signals. Groundwaves is all we got at the moment of writing, but it now appears that the QDFA works as it should. A beacon on 348 to the SE is attenuated some 10 dB more relative to a beacon on 399 to the NW. Groundwave signals to the SE on 657, 1134 and 1449 kHz are much more attenuated than 399 (which is in the desired direction). So: It works. We will not know how well until we have skywave signals, especially waiting for Longyearbyen 1485 which is in the desired direction. OJ and I worked fast and efficiently to get the QDFA finished before the rain started in the evening. It is now up, but not yet running. Looks like we'll have to wait until Saturday until we get it going. The red wine is very good, though. OJ Sagdahl arrived today at 1300 local. The QDFA setup is now underway, at present we are soldering all the leads and preparing for the outdoor work later today. Weather is surprisingly pleasant for September; 16 Celsius and sunny. Rain expected towards the evening so we're keeping the pace up (but allowing ourselves the odd beer can in between). More as it happens. Updates will be frequent!